Charlotte Cotton, who recently wrote the interesting essay The New Color: The Return of Black-and-White is moving to the Los Angeles County Museum of Art as department head and curator of photography. Cotton, who is a Brit, 36, studied at the hotbed of British photography at the Brighton University and was then a curator at the Victoria & Albert for twelve years, then at the Photographers Gallery in London, before moving tho Art + Commerce in NY. 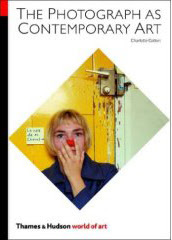 Cotton has also written a very good book The Photograph as Contemporary Art. As the LA Times puts it, Cotton is from outside the set of usual US curators who tend to move from museum to museum on a single track. "Charlotte is articulate and thoughtful, young and sensitive," Govan said. "She has a lot of her career ahead of her. Part of my interest in her is curiosity about what she would do with all that. When I met with her, it was clear that she had a real passion not just to be in a major museum, but to be in Los Angeles. That in itself seemed like such a right fit. It wasn't just the museum; it was that Los Angeles was such a fantastic place to explore questions of photography's changing role." This is a pretty good move for LACMA and photography on the West Coast in general. LACMA has a reputation for being rather less stuffy than many other museums, and this builds on that. Exciting possibilities. For my money, Cotton is one of the more forward thinking curators and critics of photography out there right now.